Hi everyone! 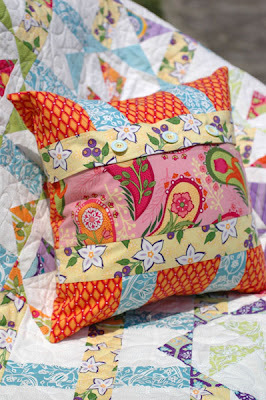 I'm excited to introduce a new complimentary pattern, the Virginia Reel Pillow. 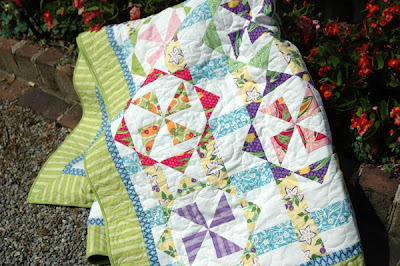 Virginia Reel is a quilt that I designed for the folks over at Fat Quarterly. Most of you are probably familiar with that magazine, but if you are not, it is an online-only magazine that comes out 4 times a year. 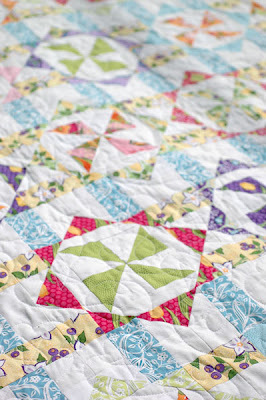 Each issue is absolutely chock full of quilts, projects, interviews - with no ads. It is really a great deal. For Issue 6, which comes out early next week, I designed a quilt called "Virginia Reel" in my Veranda line. I called it that because it is comprised of dozens of pinwheels that seem to spin between pairs of columns, just like dancers in a reel. 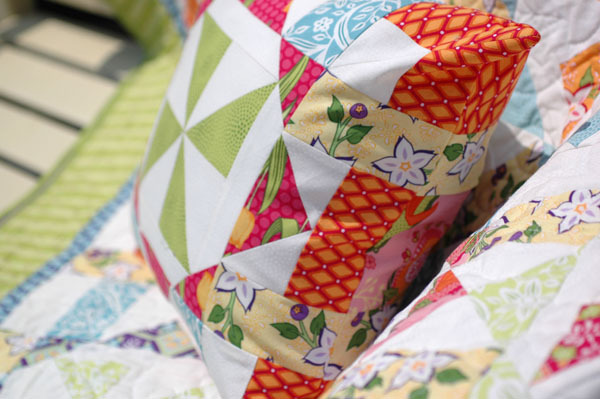 Hop on over to Fat Quarterly's blog to download the pattern for the complimentary coordinating pillow, or, if you would prefer a traditional pdf to google docs, you can download it here. Yes. I used more Doodlebug buttons for the back. Buttons with stripes! Can't get enough of them. I'm giving away my sample of the pillow right here! I so enjoyed reading your comments last week about favorite handmade gifts you have given others, so to be entered in this giveaway leave me one comment on this post (only one please) telling me your favorite handmade gift you have been given. Remember to leave me a way to contact you should you win. And please become a follower, if you aren't already. Hi - my favourite handmade gift was a handknit striped cotton sweater for my second born son. A dear friend knit it for him. I have never received a handmade quilt, although I have given away a few. Doesn't seem fair, does it?!? 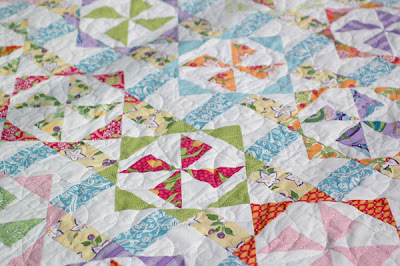 Thanks for the lovely giveaway - Your pillow is gorgeous and I think I'll be wanting to make the quilt when I see it! Fat Quarterly is great. I hate to say it but I don't think I've ever...oh no scratch that! It'd be the awesome drawings from my nephew! A few years ago a catalog came in the mail from Colonial Williamsburg with some quite expensive gifts inside. One of them was a patriotic quilt (mostly white with stars scattered here and there--it was beautiful and definitely fit the Williamsburg image). I loved it! My 20-something daughter must have picked up on the fact that I really wanted that quilt, and for Christmas that year I opened a quilt--not from CW but a duplicate that my daughter made just by looking at the small picture in the catalog! Oh my! I could not believe it! While I have been crafty all my life, my daughter sadly is not. But when she was twelve, she gave me a hand-cross-stitched card for Mother's Day - one that she made with lots of blood, sweat and tears (seriously, there's blood on the back!). It sits in pride of place on my desk and has ever since she gave it to me 15 years ago. Only love could have made her do all that stitching!! I also have a favorite handmade childhood gift -- it is a pair of raggedy ann and andy dolls my sister-in-law made me. (My oldest brother is almost 10 years older than me.) I still have them even though the eyes and noses are worn off and need to be re-embroidered. Overall, they are in good condition. One of my favorite handmade gifts I see every day in my sewing room... it's a fat pin cushion lady made with a clothespin body. My niece made it for me about 10 years ago and I still use it! Her hair looks a quite frightening now, but she's still with me, much to my niece's surprise! An embroidered pillow that my friend did for me. The color just goes with anything and the embroidery was done in all one color to match. 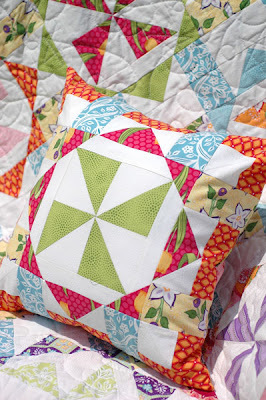 Judy C in NC thinks your pillow is a wonderful giveaway - I have a spot picked out for it. What a great gift...to receive a pillow from you. I have written before about a pillow I made for my daughter...so now I tell you the next favorite was a plaid wool shirt for my sweet father-in-law. I was ble to match the plaid on the entire shirt including the button placket. It made me happy to see how he liked it. He wore it often. my favourite handmade gift wasn't really tangible; one christmas morning, my sister read a poem to my family which she had written. it included every single one of us and our individual characteristics... it was AWESOME! she'd written it in the style of Twas the Night Before Christmas. it's the best and most favourite memory i have of our family at christmas time. 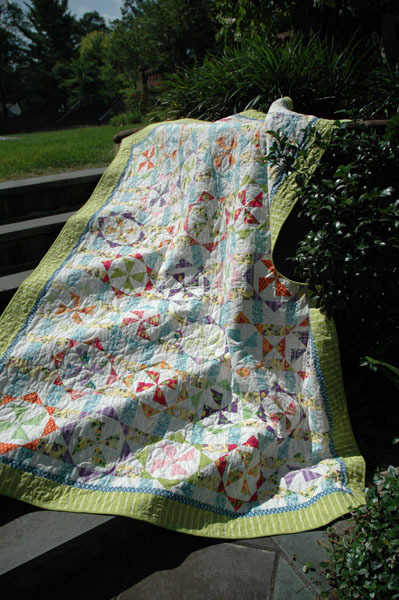 My favorite handmade gift that I received is the Chinese Puzzle Quilt that my mom made me. It took her 14 years to finish it, but when she finally did it was the most special thing to me. She started and stopped so many times and ripped the entire thing apart at one point. At 30 years old, I am still sleeping with my "blankie" :) Luckily it is vintage now, all the fabrics were purchased over 25 years ago and it perfectly matches my bedroom decor! Favorite homemade gift I've received...Okay, we're going way, way back in time here - like twenty years or better, hehe - but one Christmas, my dad made me a dollhouse. Complete with cedar-shingled roof and "popsicle" hardwood floors. Totally awesomesauce dollhouse :o) I still have it, and hope to redecorate it with my future daughters one day! My favorite handmade gifts are several but I will mention only the gorgeous jewelry my daughters and granddaughter have made for me. I treasure it all. My now deceased father was a fantastic, gifted painter in his retirement and I have several of his best work hanging on the walls of my house. And a beautiful wall quilt my oldest daughter made for me with my favorite design - hearts - incorporated into the design. I could mention so much more, but these are perhaps my favorites. I LOVE your new fabric collection, absolutely gorgeous. And the pillow design is so beautiful and colorful. I'd love to win this treasure! It's hard to pic a favourite, but I think the most used handmade gift I received was a sock project bag someone sent me as a thank you for a prize I sent them in a competition - it's used (and cherished) every day! Love this pillow! My favourite hand made gift is a recent one - a lavender scented pyramid shaped doorstop made by my neighbour. My sister makes the most wonderful photo albums/scrapbooks and I love them. I'd always planned on doing albums of each of my boys' first year (I have 3!). I thought that wasn't too ambitious. But, my mind can't do it...I need order and scrapbooking just doesn't really work that way...but sewing does! So, my sister made an album for each of my boys - I can't thank her enough! Thanks for the chance. My favourite hand made gift was a needle/cross stitch book :) Made for me by one of my dearest friends! I almost said the quilt my grandma pieced and my mom quilted, and it is very precious to me. Then I remembered the ceramic gingerbread man my son made in 4th grade. His was a pilot, not a traditional gingerbread man, and it came with a poem likening me to a hangar. I love it and cry every Christmas when I put it and the poem on my tree. He will be 26 in a few short weeks. Where would a plane be without a hangar...what beautiful poetry to a mom, lol. My mom used to make me dresses--for holidays, for grade school concert performance, once because I wanted a beautiful pink silk dress even though there was zero chance I'd be asked to a dance. She was a wonderful seamstress, but it's her patience and selflessness that I treasure most. Those were my favorite homemade gifts. Amanda a side note - you have the date for the end of this giveaway as July 24th which I'm assuming you meant tomorrow, July 28th? I love the color placement in the Virginia Reel quilt...makes those pinwheels really spin! 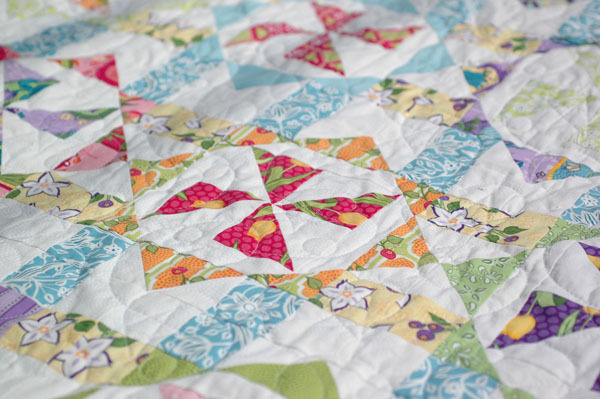 Great quilt design!